Over the weekend, John McDonnell promised that Income Tax would not rise for most of the country but that a higher rate would be levied on those earning more than £80,000. Tax reform can be pretty technical; and so one needs to look at one or two things without losing sight of the idea that the richer should pay their share. Each tax payer has a personal allowance of £11,500 i.e. the first £11,500 of earnings is not taxed; this is clawed back if one’s income is £100,00 or more by levying a 60% marginal rate on those earning between £100,000 and £121,200. There is probably enough room for a new additional rate between the 40% levied at £42,000 and 60% levied at £100,000 and £80,000 p.a. is a lot of money; only 3% of income earners get that much. It will remain necessary to increase the amount paid by those earning more than £145,000 and redress the regressive nature of National Insurance, which negates much of the 20% band, converting it into a 32% tax burden. Labour’s promise is also that there will be no increase in employee NICs nor in VAT, although again that’s not enough … VAT has to come down from 20%. I hope McDonnell has gauged this right, but there are two historical stories where a proposed tax increase has offended not just those who would be paying it, but those who would hope to pay it soon and the original authors massively underestimated the regional variances. Ed Balls proposal to levy a wealth tax on homes worth more than £2m in 2015 allegedly lost votes in London, not because there were so many expensive properties but because those within spitting distance of that value wanted and felt they needed the extra wealth in order to survive. Most London MPs argued for a re-rating of the Council Tax bands because they knew that the crude thresholds inherent in the “Mansion Tax” would be unpopular. St. John Smith in the 1992 election ‘bravely’ proposed to increase the taxes and national insurance premiums for much of the working population. Many of those whose self preservation strategies against Thatcher’s austerity was to seek to earn more didn’t find this attractive. There’s little doubt his “Shadow Budget” lost votes. Livingstone in an article in the Independent in 1999 suggests it was losing touch with the regional income & wealth inequalities that led to the loss of touch by Smith; regional wealth and cost inequality is a difficult issue which both political economists and trade union officials understand too well. Tom Bewick at Progress Online also comments. Let’s hope he gets it right and that we can make sure that foreign multi-nationals pay their share of corporation tax. We know the Tories won’t be addressing either of these inequalities. I want to add to the politics some facts. Firstly I examine the source of government revenue, and then earnings inequality and finally lok at two anomalies in personal taxation collection. We need a coherent approach to tax and the burden is not shared fairly today. The last budget shows that the vast bulk of government revenue comes from consumer tax payers. 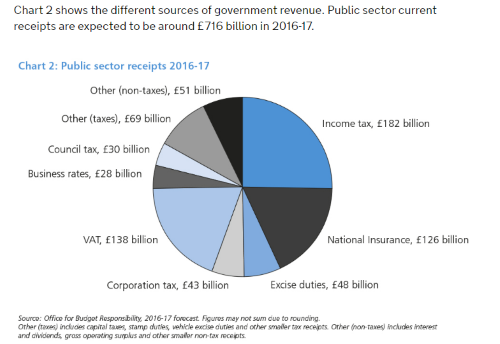 Boffy in his blog article “General Election – What Should Labour Say on Tax” points out that Income Tax raises 25% of gross revenue, VAT 19%, NI (which is shared between the workers and employers) 18% while corporation tax, a tax on profit raises 6%. There’s a lot to be said about these figures, but today, VAT is a 20% uplift on of the cost of goods. This is firstly unfair since it is regressive, which is demand suppressing and 20% is market distorting. Reducing VAT would put large amounts of money into poorer consumer pockets which they would then spend. This would created demand which is needed to grow the economy. The purpose of an economic system is to decide what to make or do, and how to make and do it; levying a 20% tax on sales is just a damper on economic activity. VAT must be minimised and there are two obvious fair alternative sources of tax revenue: Income Tax and Corporation Tax. 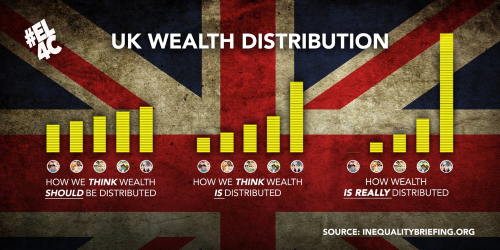 This chart below shows the inequality of income amongst the UK population and was created by inequality.org. And I have developed an alternative chart based on government figures from 2014-15. 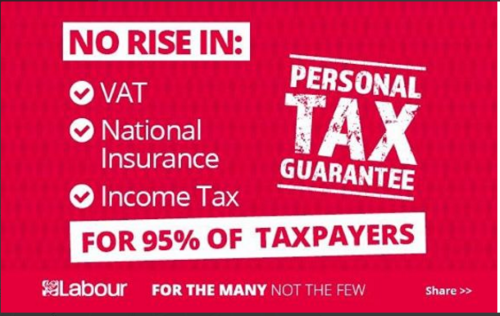 There’s a lot of money out there, but the interesting fact is that the 95th percentile income is £71,500, and that’s where McDonnell is aiming to start his new tax. There are two anomalies in the way in which personal income taxes are levied in the UK. 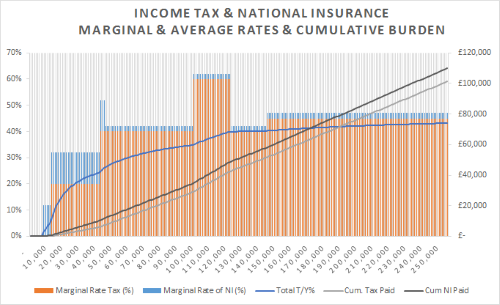 In the chart below the red bars are the income tax marginal rate and the stacked blue bars show the marginal rate of national insurance contribution. The higher rates of NIC at lower levels of income ensure that the less well off have to a higher NI burden than those “considerbly richer than yeow”. 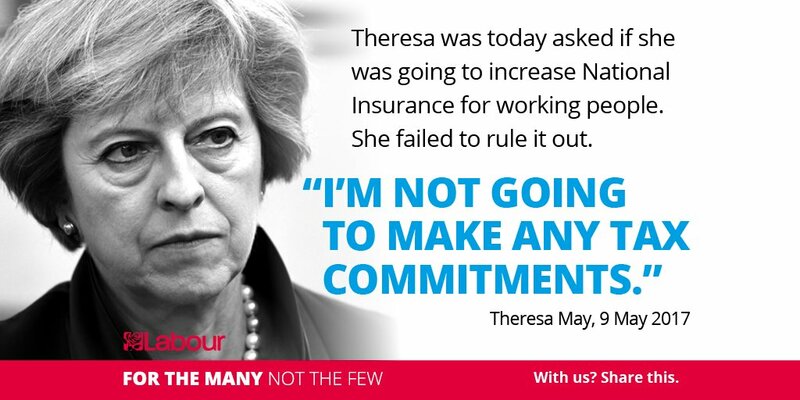 This is not something the Tories plan to make better.